So perhaps New York Rangers general manager Glen Sather was right in not giving Sean Avery everything he asked for in their contract extension talks? With Sean Avery a free agent come July 1, there is little question that Sean Avery brings an atmosphere to the game that benefits the fans and the Rangers -- his track record when he plays severely outweighs the negatives, but... Last night was one 'hellava' negative. Reaching overtime for the second consecutive and back-to-back meetings against the Philadelphia Flyers, this time it was our 'wonder-kid' Sean Avery delivering a horribly misguided pass to Flyer Jason Smith that led to Phillys' Mike Richard's game winning breakaway. The Flyers dominated the OT and the Rangers were a victim of their own system; there were few opportunities to score to take the game. It was Sean Avery who made himself available on a 3-on-2 in the Philly zone when he made the lethal pass to Smith. He knew it. You could see it in his face after Philly scored, further evidenced by his broken hockey stick after subsequently slamming it down into pieces. It can be argued that this was only one major mistake in a long season, but it can also be argued that when you are playing playoff hockey at the end of the season that these are the meaningful moments, when everything counts. Sloppy play is not tolerated when you are a 'loss and a half' from not qualifying for the playoffs. We gained a valuable point, but we ate two in a row to the Flyers. Damn it! Last night Sean Avery lost some negotiating leverage come the off-season. Last night we lost the game because of (UPDATED)....Sean Avery, Marek Malik, Henrik Lundqvist, Bucklehead Backman and the entire team for their laziness, shortsightedness and lack of passion!!!!!!!!!! TDR man, bringing the darkness. I have to disagree that we lost the game because of Sean Avery. He turned the puck over to start the rush that resulted in the game winner. Why not blame Malik for not covering Richards, or Hank for not stopping an easy shot? Or even better, the entire offense for only scoring ONE goal in the game against a weaker team? Or Perry Pern for his abortion of a power play? To blame last night's loss on Avery's pass is really nearsighted man, I gotta disagree. In honor of your comments, Scotty, I have updated the post. I place Avery in first position, though. Another free point for the NYR. The rules are crazy TDR. 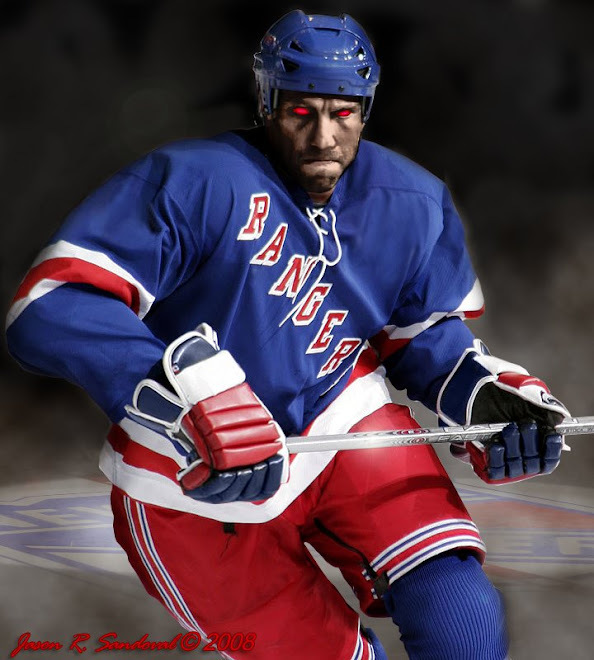 The Eastern Conference is wide open for the NYR to make the the Cup Finals this year! The King is ready and Jagr will prove many people wrong this season. 1) So what do you guys think its gonna take Sather to retain Avery? Sure he may have contributed to the loss, but its been pretty clear that the team is much better with him than without. I think everyone needs to recognize , as BlueNationLeafs stated,the East is wide open and the Rangers are not playing worse than most teams, except for perhaps Pittsburgh and Montreal whom they've played well against. Faux, I believe Avery will be retained as well as Jagr, Avery with a three-year deal and Jagr with one plus an option. The Rangers will also get cap relief from Shanahan, Straka, Rozsival, Malik, Mara, and Strudwick, assuming most don't re-sign. No time to be negative boys! I remember a great Oilers team winning the Cup with Mess as the Captain and Gretzky off in LA on a beach. It was the “Kid Line” with Martin Gélinas, Joe Murphy and Adam Graves that were huge for the Oilers. Look at this team's veterans with Jagr,Straka and Shanny...Players in their prime such as Drury, Avery and Gomez. 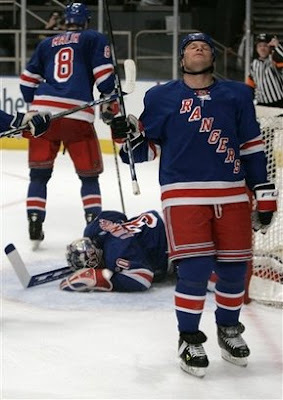 The Rangers youth is about to come through in the 2008 Playoffs. For God's sakes, I'll take five more one-point-overtimes!!!! That'll get us in. Pucks...you gotta let me go negative until we qualify...then I'll be "The Light Ranger" for the playoffs for all you optimists. You won't recognize me. If we don't make the playoffs, it's going to be a busy summer. Faux..I feel Avery will stick around -- I know he's good for the team, but we are all so afraid to blame him for anything -- certainly Slats knows that he is as much a liability as he's an asset -- which is why he didn't accept any Avery demands...I heard from MSG in the range of $3.5 per year for 3 years plus option -- so you are pretty dead-on. Truth be told, he may not be worth that much. Despite what my dear buddy-blogger Pucks thinks...I don't think Jags stays, Malik is gone, Shanny is gone this summer -- and I unfortunately believe (because it's in his blood) that Slats is going to trade a Dubi, Callahan or Girardi post-season for a veteran-type for the blueline support. BLUENATIONLEafs...I love your "King" optimism...the sometimes world-class/sometimes AHL goalkeeper HAS to step up these last 6 games --- he is THE KEY TO OUR SUCCESS. Plain and simple. We have found our offense, the defense is mediocre (but sometimes surprisingly good) and then there is our net....the King, oh um...the Prince...the Pauper...wow, and now The King again. It is just too much to handle. Good points though. Just want to remind you all that the Flyers just beat your Rangers two games in a row, and to please not move on from it quite yet (it tastes so sweet). Mother Momentum seems to be shifting a bit for the good guys in orange, and I have to say that you Blueshirts seem entirely too confident about even making the playoffs. Have fun with the Devils tonight, we'll see if the Rangers start falling apart here at crunch time, as predicted by The High Flyer!